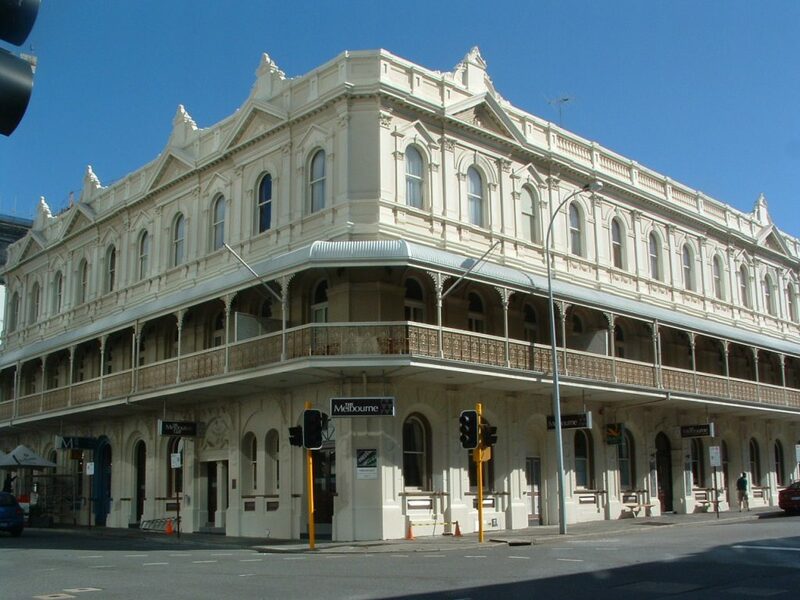 The Melbourne Hotel was opened in April 1897 during a hive of building activity in Perth, brought about by the 1890s gold rush which quadrupled the city’s population. What makes this building so special is the fact that it has hardly changed in appearance since it was built. A majestic landmark, the Melbourne Hotel was built for a Melbournian, Grace Lannin, who had previously run a boarding house on William Street. She promised customers “good table, clean beds, airy rooms, moderate charges and shower baths”. The Melbourne Hotel demonstrated the confidence and opulence of hotels built during the first gold boom in Perth. The stunning and ornate architectural elements of the era, like the elegant first floor balcony, cantilevered out over the pavement on both streets, a grand staircase, lift, high ceilings and the grand facades, show the importance of hotels to the expanding city population and ever-increasing trade from country visitors. In 2017, the Melbourne is closed and undergoing refurbishment to transform it into a boutique hotel, and there are plans to introduce a tall tower behind it. The site of the present hotel, on the corner of Hay Street and Milligan Street, was originally occupied by the Eagle Tavern. At the time of the Melbourne Hotel’s construction, Western Australia was experiencing the wealth, prosperity and security of a long running gold boom. Opulence, optimism, and confidence in the future of the State and the reign of a new King, Edward VII, heralded a new era in the quality of architecture employed around the city. Built by an unknown architect, the Melbourne, on its corner site, demonstrates the confidence and opulence of hotels built during the first gold boom in Perth. Featuring stunning and ornate architectural elements of the era, like the elegant first floor balcony, cantilevered out over the pavement on both streets, a grand staircase, lift, high ceilings and the grand facades, show the social significance of late 19th century hotels which offered accommodation and service to the expanding city population and ever-increasing trade from country visitors.